The bagworm caterpillar lives its entire life inside a tough protective case made of silk and camouflaging bits of foliage. Each caterpillar makes its own bag that it carries around as it feeds with the head and legs sticking out the open, top end of the bag. As the caterpillar eats and grows the bag is enlarged until by the end of the summer, what started as tiny pods only one-quarter inch long will have grown to almost 2 inches in length. In the end of the summer the bagworm caterpillars stop feeding and seal each bag shut after securely tying it to a twig, stem or even nearby structure. Inside the bag the caterpillar transforms to the moth stage. The adult female moth does not leave the bag the caterpillar created. She remains inside while the winged, male moth does emerge to fly about the infested tree to locate the waiting female. After mating the female lays 500 to 1000 eggs within her bag and then she dies. The eggs remain in the bags on the trees till the following spring and hatch about mid-June to start the cycle over. The bagworm commonly attacks arborvitae, red cedar, juniper and spruce trees though it has been reported to eat the leaves and needles from over 128 different trees and shrubs. Attacked plants may be partially defoliated, weakened and rendered unsightly though it is not uncommon for complete defoliation to occur resulting in death of the conifer trees mentioned above. 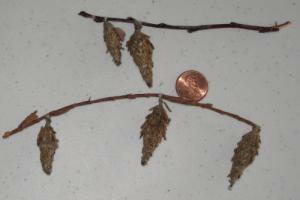 Bagworm cases from previous season. If you have had bagworm infestations in the past, or if you have conifer trees in the southern half of the state, carefully inspect trees and shrubs for the bags or pods. The bags hanging on the trees in the fall and winter contain the eggs for the next generation (they will hatch the following year). These can be removed from small trees by hand and discarded anytime before June. Caterpillars emerge from overwintering eggs within the bag in June and create small bags as they begin to feed. It is important to watch for the tiny caterpillars and treat only when caterpillars are present. Look carefully for the small bags. The young bagworms are hard to see at first; stare intently and watch for the wiggling bags made of bits of plant material. 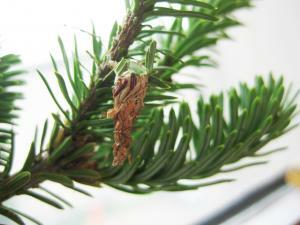 When many small bagworms are present and feeding, an insecticide may be needed to prevent serious damage. Insecticides become much less effective as the season progresses because of the increased size of the larva and its bag. Treatment in late June to early July before bags exceed 1/2-inch long is recommended. Small larvae are more vulnerable to insecticides, and feeding damage is relatively minor. Most commercial and home landscape insecticides are effective against small bagworms. Read and follow label directions and purchase a product labeled for the site and host you will treat. Examples of commonly used insecticide active ingredients for homeowners include azadiractin, Bacillus thuringiensis, bifenthrin, carbaryl, cyfluthrin, permethrin and spinosad. Deer have eaten the foliage on the bottom portions of several arborvitae. Will the bare areas green back up in spring?